Our tradition to this point has been to go on cruises with our sailing club to gain confidence and then to strike out on our own to push our boundaries—literally and figuratively. Following in that pattern, we decided to try to sail to Atlantic City by ourselves, about twice as far as any sail that we’ve ever attempted. We didn’t have a whole lot planned. The long-range wind and weather reports are notoriously sketchy, and we weren’t sure how to calculate certain things, like how much current there would be during certain parts of the trip. Current would actually be a recurring theme: there’s almost no tidal swing where we usually sail, and essentially no tidal current, so we’re not used to dealing with it. We can get numbers for tides at inlets, but have little understanding of how that impacts the water in between. The basic plan was to sail to Beach Haven, spend the night there, and then to continue on to Atlantic City, leaving plenty of time to recover in case the tides were killing our speed. We also planned to do everything on the inside, meaning that we’d stay in the protected areas behind the barrier islands that line much of the coast of New Jersey. How or when we’d return was rather fluid, but we took enough time off of work to allow for a wide range of possibilities. We left around noon, attempting to make slack water at Beach Haven around 1900. There were steady winds from the north and northeast, which is an unusual wind direction for the bay but one that made for fine downwind sailing. We started on just the jib because it looked like we’d be on a broad reach, but it was far enough behind us that I felt like we could potentially go wing and wing. After racing with Providence II and seeing how well their preventer worked, I decided to try to rig our boat to fly the main by the lee. It worked great for about 30 seconds, then wind shifted and the main fully backwinded, but at least the preventer worked and kept us from accidentally jibing. We made record time down the bay. As we approached the Barnegat Triangle near the Route 72 Bridge we were reminded of the debacle that was our last sail to Beach Haven. We took pictures of the old drawbridge pilings where our first tow boat’s engine died. I was half expecting to see a plastic wreath, a makeshift fouled anchor, and a faded photograph of his outboard as some kind of roadside/channel memorial, but our thoughts turned toward the positive when we saw the casinos of Atlantic City in the distance. The wind slowed throughout the afternoon, and was nearly non-existent by the time the channel swung us over by the island. Jen got our approximate speed from her telephone, I broke out the dividers, and we figured out that we should probably motor the rest of the way to avoid docking in the dark. As it was, we arrived with plenty of daylight, around 1830, but being able to see had no impact on my docking ability (with “impact” being the operative word). We don’t really get to practice docking, much less with a 180° turn from the fairway and current running 90° to the slip, and FSM forbid that we should have a cleat on which to tie off instead of four creosote-soaked pilings. We eventually got the boat secured with a lot of help from the dock guy, and were able to proceed with unwinding. We woke up early and made coffee and a simple breakfast. Jen converted the boat from sleep mode to sailing mode while I got ice and fuel. The dockmaster gave me some tips on how to get to Atlantic City, which I ate up as if they were plot devices in an Indiana Jones movie. We really had no idea what was in store for the next portion of the trip…the area behind Brigantine and the nearby islands is not like anything in Barnegat Bay or Little Egg Harbor, at least at it appears on the charts. It’s all marshes and islands with narrow cuts and the threat of weird currents with several openings to the ocean. As soon as we made the left turn out of the marina the real adventure began. There was no wind and our sails remained stowed as we motored down the rest of Long Beach Island, making good time going with the current. We’d never sailed south of Beach Haven, but in a strange flashback to my Piney upbringing I suddenly recognized something. Many years ago, our friend Jimmy James led us on a trip (by car) to what he called Seven Bridges to see “The Stink House,” which was supposedly an abandoned fish processing factory. When we saw the rusting water tower, I knew immediately what it was, and some quick research now shows that Jimmy James was exactly correct. Here’s an article from the Tuckerton Historical Society on the subject: The Stinkhouse on Crab Island, which shows that this is more than just Piney Lore. It was also around this time that we saw the southern tip of Long Beach Island, and could see Little Egg Inlet and the ocean beyond. We had previously been warned by club members, in no uncertain terms, to never take a sailboat through Little Egg Inlet. It’s a natural inlet with no breakwaters and apparently can be a mess. We had no intention of running it, but once we got in front of it we got a very small taste of what it can do. The tide was still going out, and as we crossed the clearly visible delineation of water flowing south out of Little Egg Harbor (with us) and water flowing east out of Great Bay (against us) we nearly came to a stop. I was hoping that the current would be weaker next to land, so I moved well out of the channel, pointing straight for the old Coast Guard station. We must have looked like we didn’t know what we were doing, because a guy on a skiff motored up to us and asked plainly, “do you know what you’re doing?” He cautioned that we were only in 8ft of water, but that was actually good news for us. We still had our keel up to make us a more efficient motor boat since there was still no wind, so I assumed that we had plenty of room to push in toward land and try to force our way through slower water. I have no way of knowing if we would have fared any differently going through the marked channel, but we didn’t touch and were able to make between 1 and 2 knots of speed over ground, slowly working our way west. Seeing the confined rough patches of water at the confluence was kind of mesmerizing, if disconcerting. There were pools of turbulence with sharp definitions where the two streams of water were grinding against each other, and with no wind it was clear that the flow was completely responsible for the disturbance. The closest thing that we had to a Scylla for this Charybdis was the rare but adamant powerboater. Traffic was light, especially on the inside through the marshes, but as we wound around the tight channels we did get rocked a few times by large boats. In fairness, the majority of the powerboats we encountered were quite polite and patient, specifically coming off of plane to pass us when there was room, but with our keel up and sails down, we did get especially punished when one of them would run by kicking up a 4ft wake. I was focused heavily on following the channel markers so I may not have been taking in the scenery as much as I should have been, but it was fairly pristine [looking] salt water marsh, much like the sedge islands near the Barnegat Inlet, but extending for miles. Jen said something like “we usually only see land like this from bridges and overpasses,” which was true: this is the kind of landscape that’s easy to ignore when driving from one profane T-shirt shop to another along the Jersey Shore, but it was nice to actually be in it instead of over it. 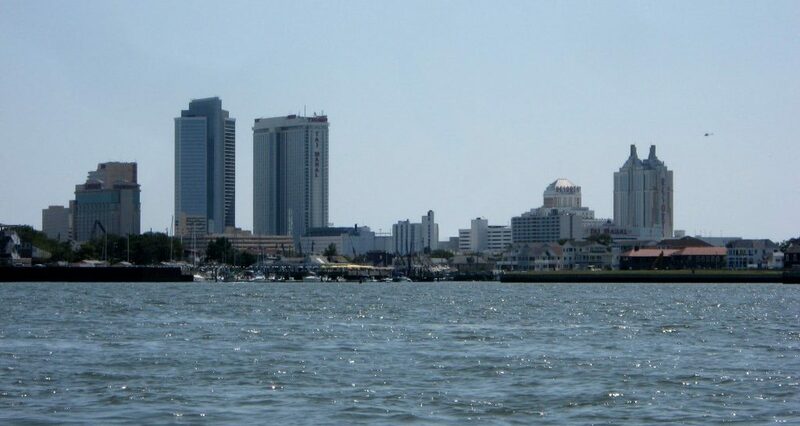 The casinos and high-rises of Atlantic City remained a fixture on the horizon throughout this leg of the trip, and loomed ever larger as we approached. Although we’ve been to AC dozens of times from land, it was very different to see it from the water, and it was different to be sailing beside such verticality, since we’ve never sailed in anything like a city. At marker 182, we left the Intracoastal Waterway and headed toward the Route 87 Bridge. We radioed the Frank S. Farley State Marina when we got to the Coast Guard station and got our slip assignment. I thought I misunderstood when he said “H Dock,” not imagining that they had docks going all the way up to number H (and it didn’t help that H is “hotel” in the phonetic alphabet, since the marina is run by the Golden Nugget Hotel & Casino). It turns out that they actually go up to J—the marina is enormous. We docked around 1430, a mere 4½ hours after departing Beach Haven despite motoring against the current for much of the trip. I stuck the landing this time. The dock attendant changed our slip assignment to one that would allow us more room to maneuver, and our docking was far less dramatic. When we got a chance to wander around the marina, we found it to be really nice. We don’t have a whole lot of marina experience, but it featured things like huge, stable floating docks (no need to account for the tide when tying up), large clean bathrooms (with air conditioning! ), and access to many of the hotel’s amenities, like the pool, gym, and spa. Fans of Boardwalk Empire will also be interested to note that the marina’s namesake, Frank S. “Hap” Farley, was the guy who took over for Nucky Johnson (the inspiration for Nucky Thompson) as the boss of the Republican political machine of New Jersey after Nucky went to prison in 1941. We attempted to celebrate Atlantic City’s historic reputation as a den of vice to the best of our ability. We tidied up and went out for a bit of shore leave. We’re not really gamblers, and unlike Vegas, there isn’t much to do in AC if you’re not bleeding huge sums of money at the tables. We took the Jitney over to the Tropicana, since they have a vaguely interesting indoor promenade of shops and places to eat other than buffets or Hooters. I played a slot machine for about 2 minutes and, like Aaron Burr, dropped a Hamilton, but that was enough gambling for me. We got a surprisingly good dinner at a chain Cuban place, where Jen surprisingly drank a distinctly non-Cuban caipirinha. We walked out to the beach where we looked at the ocean in the dark, walked past the old Ritz-Carlton hotel, and found a bar selling Victory Festbier, which may be my favorite beer. I woke up early Friday morning and was treated to the blue moon setting behind the Borgata. As usual, our camera doesn’t really do it justice. I don’t see many dawns in my day to day existence, but I routinely do on the boat, and they’re often majestic. We had been watching the weather closely. This trip was more about the journey than the destination, and we had at least four possible plans for how to get home. Sunday was looking bad, with the remnants of Hurricane Isaac rolling through the area, so we wanted to be home before then. The wind forecast for Saturday was sketchy, with light winds from all over the place. But the forecast for Friday was just about perfect: 10-15kts from the southwest would mean that we could sail all the way home. I figured that since it only took us 10½ hours to get down there over two days, if I could actually time the tide change correctly we could probably get home in less and do it all in one day. 10+ hours of sailing seemed better to me than a few hours of sailing, another overnight in either Beach Haven or Tuckerton, and then 6 or 7 hours of motoring into the wind/no wind. We discussed it and made the decision to go, sacrificing overall vacation time for a good sail. I think we made the right call. We shoved off around 0830 and only ran the engine until we got through the bridge to Brigantine. We hoisted the sails and proceeded to glide through the marsh, which was absolutely amazing. The overwhelming sensation for me was one of silence. There was no sound except for the occasional call of a shore bird and the gurgle of our wake behind the rudder. Returning was much less stressful, and although it’s not like I memorized all of the twists and turns of the channel, following the marks seemed a lot more straightforward. The sailing was technical—sailing mark to mark and staying in deep water required a lot of jibes, re-trimming, and course correction to not get pushed around by the current—but it wasn’t taxing. Or maybe it was just worth it. We saw lots of birds: osprey, egrets, herons, terns, and cormorants, among others whose names I don’t know. One bit of wildlife may have been the highlight of the whole trip for me. I saw a cormorant dive a few boatlengths ahead of us and pointed it out to Jen. We were intently scanning the water to try to see him surface when we heard a huge gasp of air off our port quarter. Jen thought it was the cormorant, but it was way too deep and just big. Before he dove back down into the murky water, I got a quick glimpse of an immense sea turtle. I’ve seen snapping turtles with shells as big as a trashcan lid, and this guy was like twice the size…his shell must have been 4ft from head to tail and he was thick. I’ve never seen anything like it. I’m not sure that sea turtles are even supposed to be in those waters, but we were getting much closer to the inlet by then. This was another source of amazement. As we approached the Little Egg Inlet, it was clear that I’d mistimed it again. The tide was going out fiercely, and as we approached the southern tip of LBI, the wind was set against it. The wave patterns were ridiculous…things I’ve never seen before, like waves that appeared to break in place for extended periods of time without moving forward, and perpendicular waves in a grid pattern. It was awesome, in the original sense. As fascinating as it was to witness, it all screamed “get out of here,” so we fired up the engine and powered upstream as best we could. The cruise back to Beach Haven to was a slow slog, but once we got past the BHYC we were able to sail again, and we sailed pretty much all the way back. It was hot out, we were tired, plagued by flies, and Jen got a little sunburned despite her diligent use of SPF 10,000 sunscreen. It was intense, but I loved every minute of it. We arrived around 1900, equaling our 10½ hour time down but completing it all in one day. This was easily our most epic cruise to date. I’ve started using OpenCPN to do nautical measurements so I’m reasonably confident that we did about 81 miles total. At 21 hours, we averaged just under 4kts. We barely burned any gas, and didn’t come close to dipping into the extra two gallons that I’d stashed on board. Jen and I aren’t exactly naturalists, but our sail through the sedge was fantastic beyond the simple newness of it all. Even with our keel down, drawing 5ft, we didn’t touch once south of Little Egg Inlet. Seeing the currents in action at the inlet gave me more respect for the tide, if not much more knowledge. Fortuitous performed admirably, as always, and carried us safely where we needed to go. There are more pictures in the gallery here, but be warned that there was a piece of dust of something on our camera so there’s unfortunately an anomaly in most of these shots. Thanks for reading. We’d like to hear your feedback, so please comment or drop us a note. Love the adventures! Keep em comin. Thanks for reading, S/V Mrs. Chippy. Great trip to AC. Sounds like a lot of fun. Yeah, it was fantastic, and a really momentous sail for us. Thanks for checking out our log, Ron.